Today we had planned to visit the Canadian Parliament and the Mint. However, President Barack Obama also planned to visit the Canadian Parliament, and to have a meeting near the Mint. Guess whose plans prevailed? After breakfast, we took a walk toward the Parliament Buildings to see if we could at least see them. A few blocks from the hotel, we were stopped by barricades; the street had been closed in anticipation of President Obama’s arrival, and there were police everywhere. We (and quite a few others) waited a while under close supervision by the police, who even required that we back up 3 feet from the barricades. After all that, the motorcade didn’t even pass close to us — it was about one (short) block away. Nevertheless, we did get to see the President’s limo, ever so briefly. After the motorcade passed, we were able to walk in front of the Parliament building known locally as “Centre Block”, at a considerable distance of course. 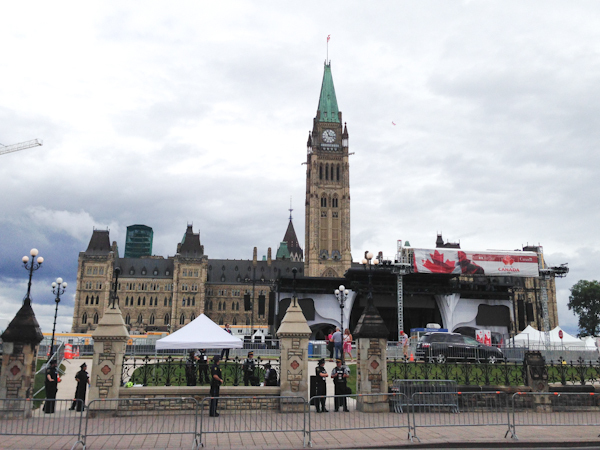 There was also quite a bit of preparation for Canada Day celebrations the day after tomorrow. We stopped in at the tourist information across from the parliament building, then bought bus tickets to take us somewhat close to the Canada Aviation and Space Museum. 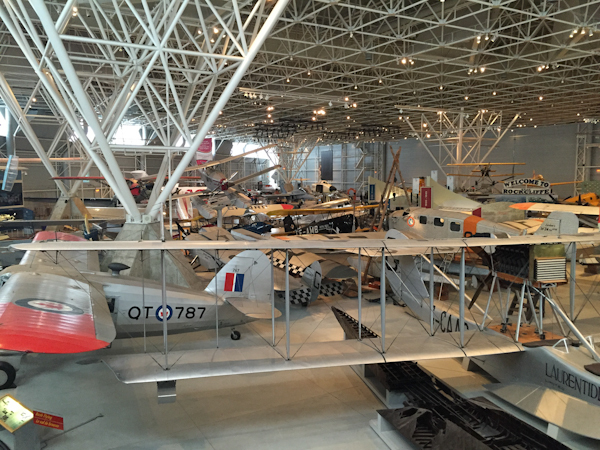 After a bit of a walk there, we enjoyed a well-presented museum highlighting Canada’s contributions to aviation and space exploration. Besides the many exhibits of old planes, there was an informative section on the International Space Station, highlighting what living there is like. It featured videos of Chris Hadfield, the Canadian known for his active social media presence from the ISS. We agreed this was the high point of the museum. After returning on the bus and relaxing a bit, we set out for dinner, again in the direction of the Parliament buildings. While it was clear that there was no motorcade about to pass by, the police presence was heavy and there was a helicopter hovering overhead, signaling that the President had not yet left. By the time we finished our dinner, the police presence had all but evaporated. One last treat for the day was a stop at a “beaver tail” stand for dessert. A beaver tail is a flat fried pastry about the size and shape of a beaver’s tail, to which various confections are added on top. We decided on the apple/cinnamon beaver tail, which we brought back to the hotel and split 3 ways. It was highly decadent — and recommended.